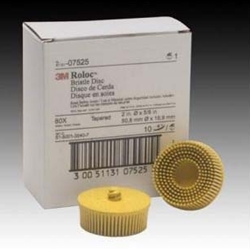 Scotch Brite Roloc Bristle Disc 2" x 5/8 Tapered MED BOWES 3M 7525. Gen. Purpose Scuffing Wheel(maroon) constructed of a non-woven,durable,3-dimensional material. Flexible and ideal for machine scuffing/cleaning hard-to-reach areas. Use 3M holder #7500 for easy changing of discs.